We are leaving Seattle, our most North West point, to start slowly our trip back home towards east. Our first stop was to visit the famous Yellowstone Park. Yellowstone is considered to be the first ever National Park since it was opened in 1872. On this site, several million years before, volcanic activity happened. 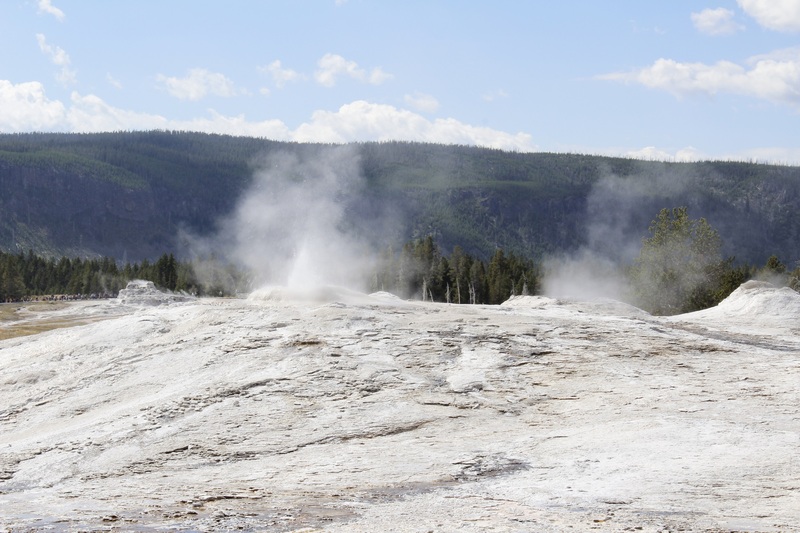 Today, the park is renowned for its famous geysers and hot springs. 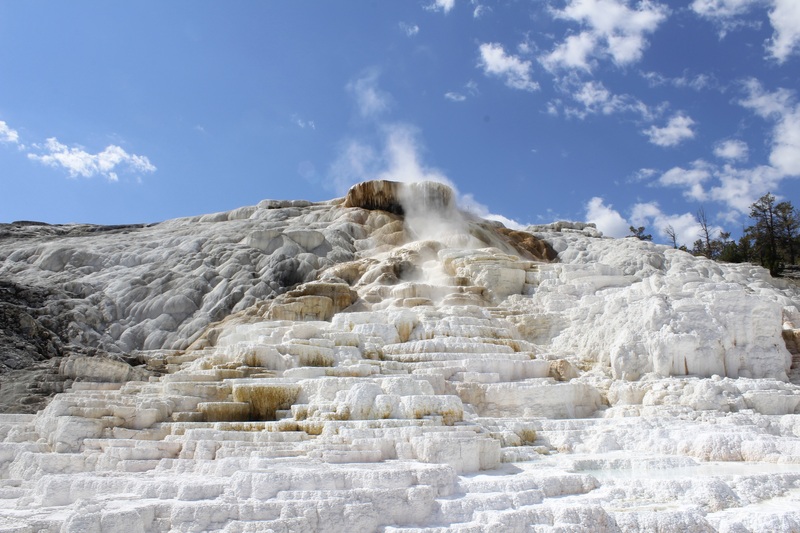 We entered the park by the North entrance and started our visit with the Mammoth hot springs. These hot springs created kind of a white stairway were they are flowing. It is very special to see all the hot steam coming out of the ground! We have been warned to stay away from those sources since their hot temperature can cause serious injuries to the human body. We got back in the car and kept rolling. 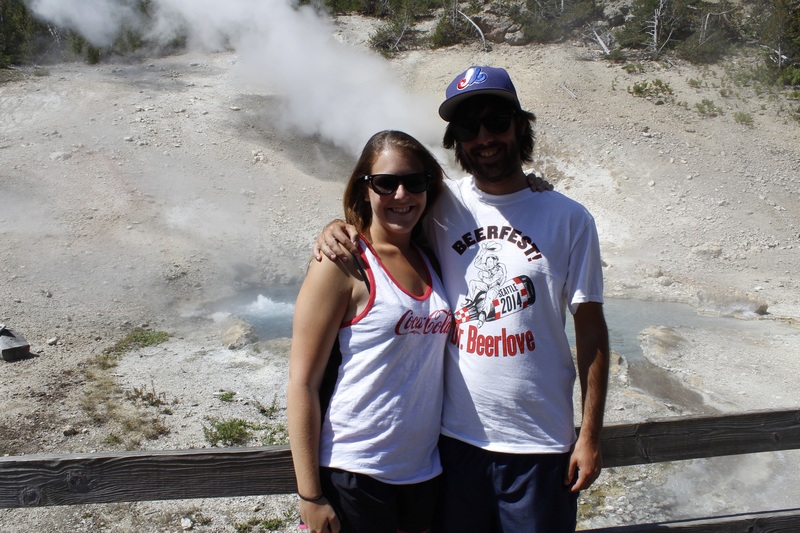 We stopped at many different places to see small geysers and crystal blue water basin. 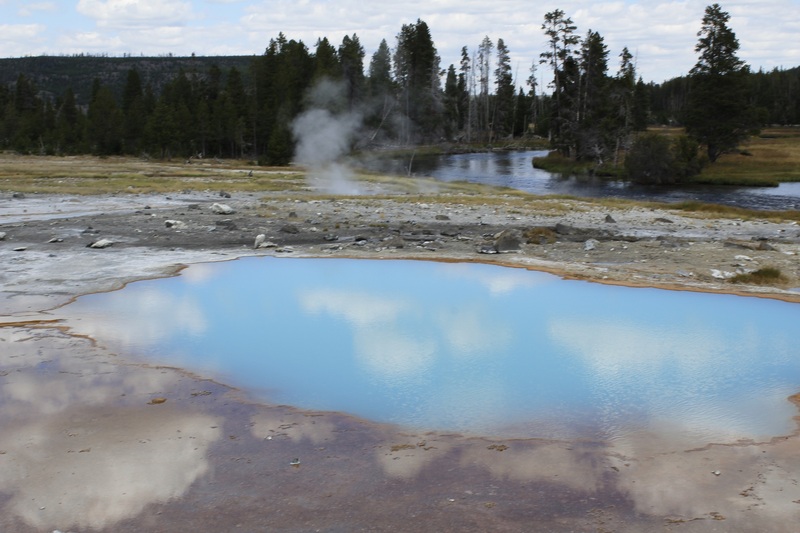 The blue color is created by the bacteria formation in the hot water. It is really something to see! 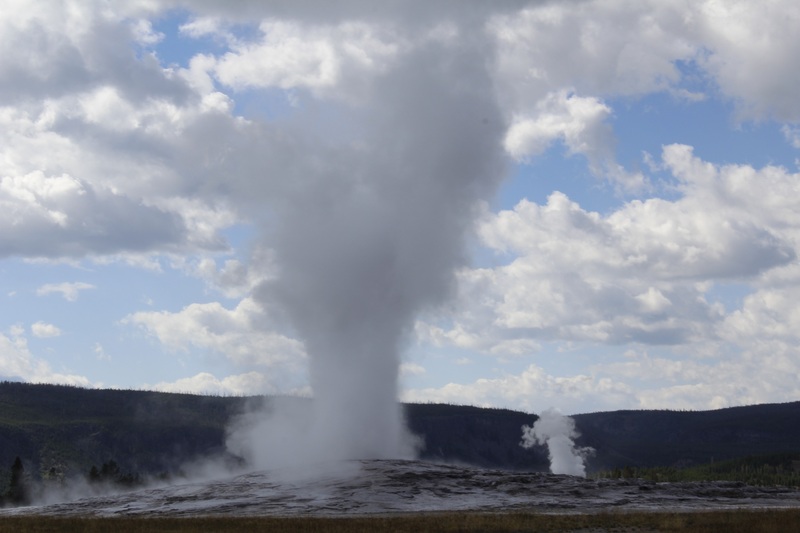 One of the main goal of this visit for us was to go see the world famous Old Faithfull Geyser. It is well known since it is the biggest geyser in the park and it can pushed water several meters in the air! Also it is known to have certain regularity in its eruptions: they are coming at every 40 to 126 minutes. What a phenomenon. 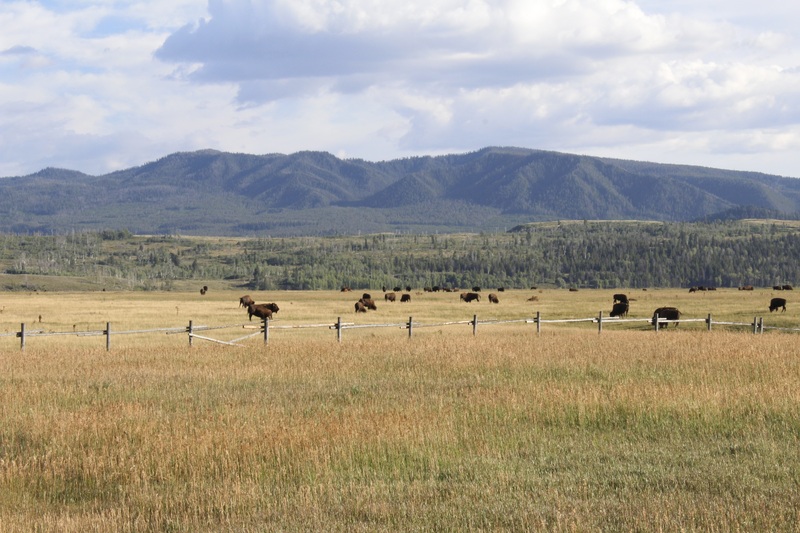 We understand more why so many persons are doing the long travel towards this park in Wyoming. 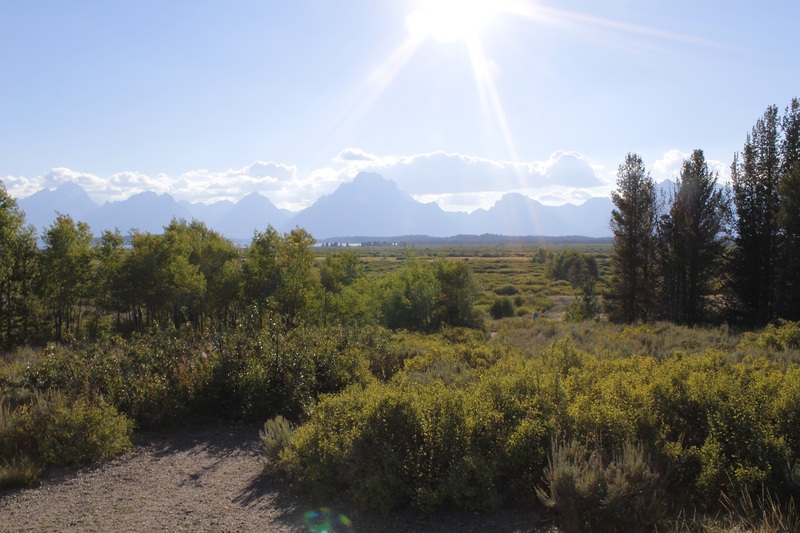 We hit the road again toward the south so we could catch a glimpse in Grand Teton National Park. We had to stop on the road since there were intruders blocking the way: not protestors but Buffalos! 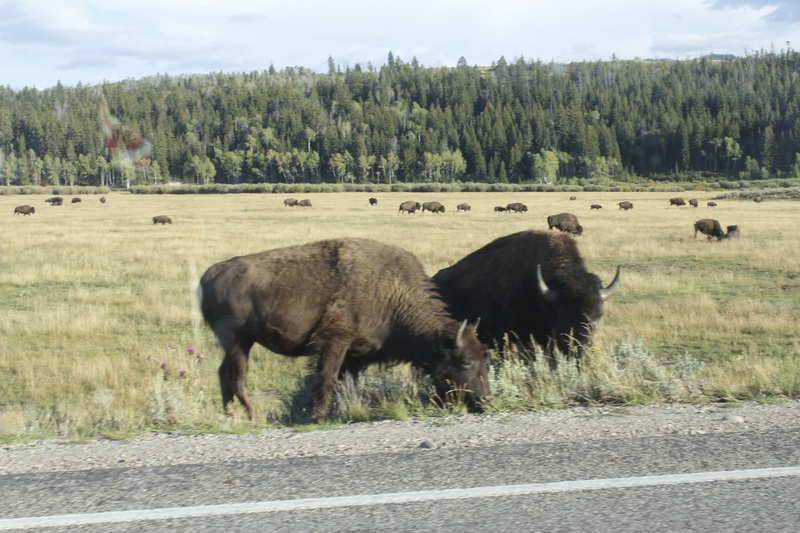 The Yellowstone Park is also well known for its wild life: Elk, Buffalos, wolves, bears, etc. The buffalos were slowly crossing the road in front of us! Watch out! We read that every year, many visitors are getting hurt by buffalos since they are trying to come to close from them. We finished our visit by going around the Grand Teton, well known for its big mountains and snowy summits. Usually, the united States are known for their big cities and sky scrapper. During this trip, we were witness that there is so much more to this country. We’ve seen so many breathtaking natural attractions. Even though the government has made some cut in the National Park system recently, we consider that it is a really great system that can join accessibility for tourist and the preservation of wildlife and nature. 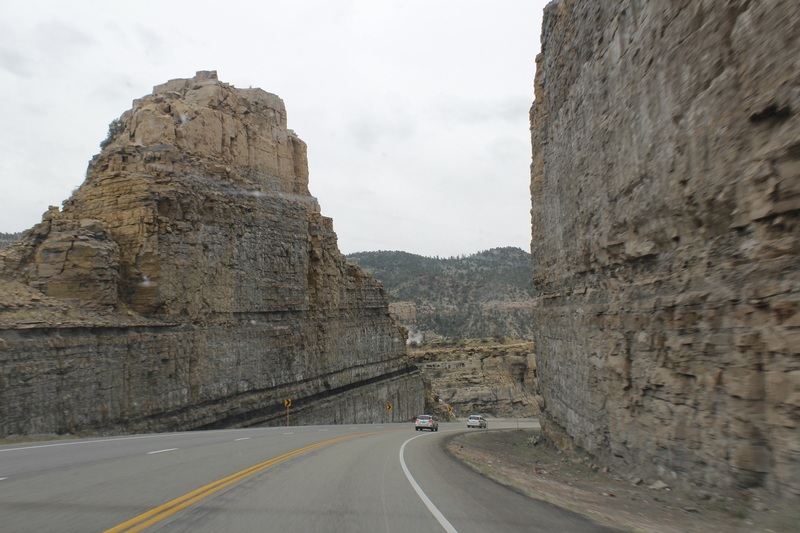 We left Yellowstone Park and we drove down to Salt Lake City. The city, that is also the capital of Utah, is located near the lake with the same name. We took a night in a campground so we could shower and cook ourselves a real meal! How could we describe Salt Lake City? 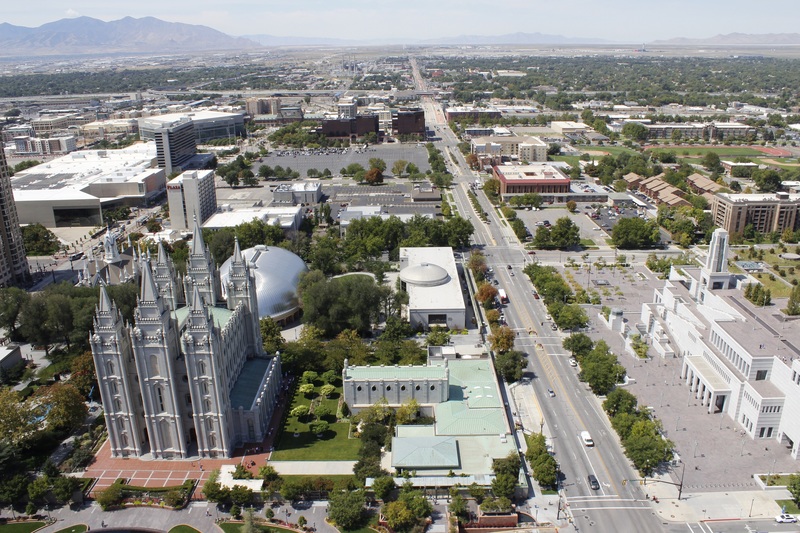 For those who have never been there, Salt Lake City is the center spot of the Mormon religion. 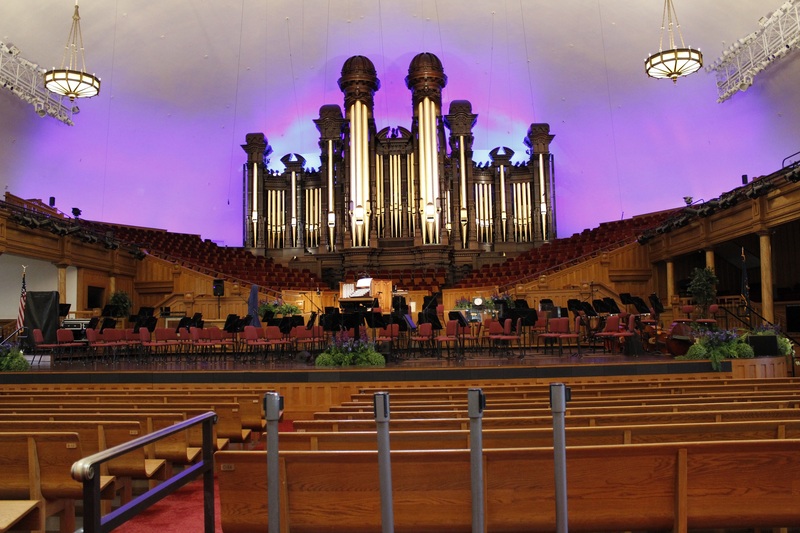 We could visit Temple square: an area where you can see and visit many buildings related to the Mormon religion. Good news for us, everything is free! We started with the Tabernacle were we saw a great organ show. We then visited the Beehive house, a historical house that belonged to Birgham Young, the second prophet of the Mormon religion. Everywhere we’d go, missionaries would welcome us and answer every question we’d have on the buildings and the religion. Plus they are all very nice! We went to the top of the Church office building where we got a great view of Salt Lake City downtown and of the Mormon temple. This temple was built between 1853 and 1893. We cannot visit it since it is reserved for members and rituals. One of our best discoveries was the family history library. It is home to the largest genealogical collection in the world. Still free of charge, volunteers are guiding us in the massive database so we can discover documents and family trees. I was able to find my grandfather baptism certificate and my great grandparent’s marriage record. I was also able to see my family tree up to ancestors in France! We finished of the day with a one hour movie on the life of Joseph Smith and the creation of the Mormon religion. We loved to learn more about the Mormons and their way of thinking. Those people were welcoming and they didn’t try to convert us to their way of thinking. There is no solicitation of any kind, they just seem to want to show what do they believe in to people that are ready to hear it. We left Utah and headed to Colorado. At a gas station, we saw 2 Quebec license plates! We stopped a few minutes to talk with those two Quebecers who were also on a road trip. We traded some crazy stories! We slept (again) in a Wal-Mart parking lot and we had a rough night: leaf blower at 2 A.M. and street cleaning truck at 4 A.M. so we didn’t get too much sleep. Morning came and we headed to the city of Golden to visit. Why were we visiting the town of Golden? To visit the Coors brewery of course! It was Labor Day weekend so obviously there was a lot of people visiting the brewery. 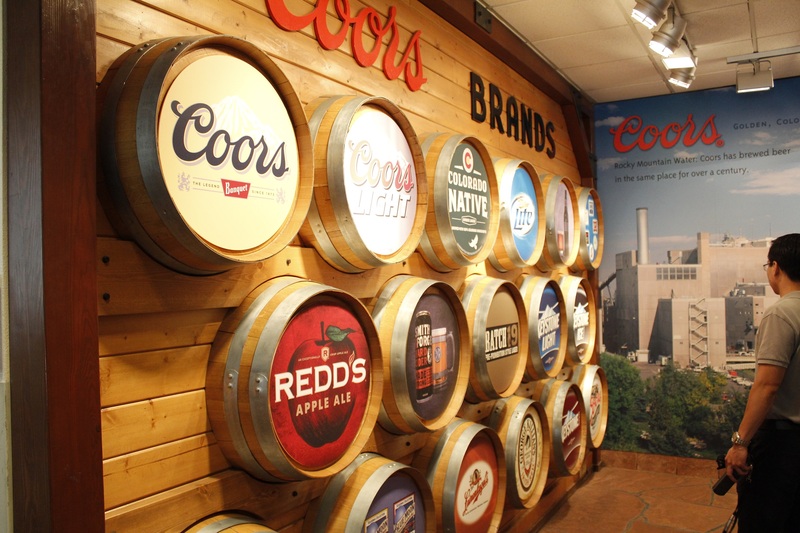 At the Coors brewery, we had a self-pace visit with an audio guide in our hands. 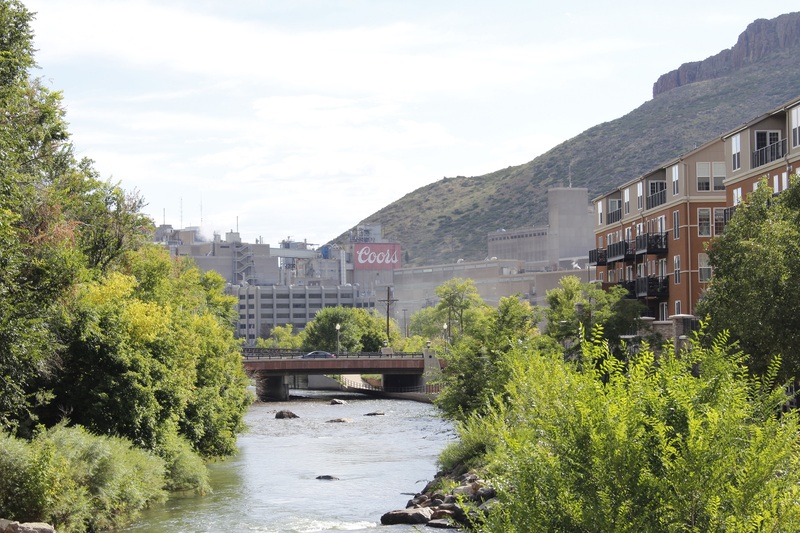 We learned a lot about the creation and development of this brewery that was created in the Rockies for the water. We realized that a lot of the visitors were in a hurry to finish the tour so they could get to the end: tasting room! 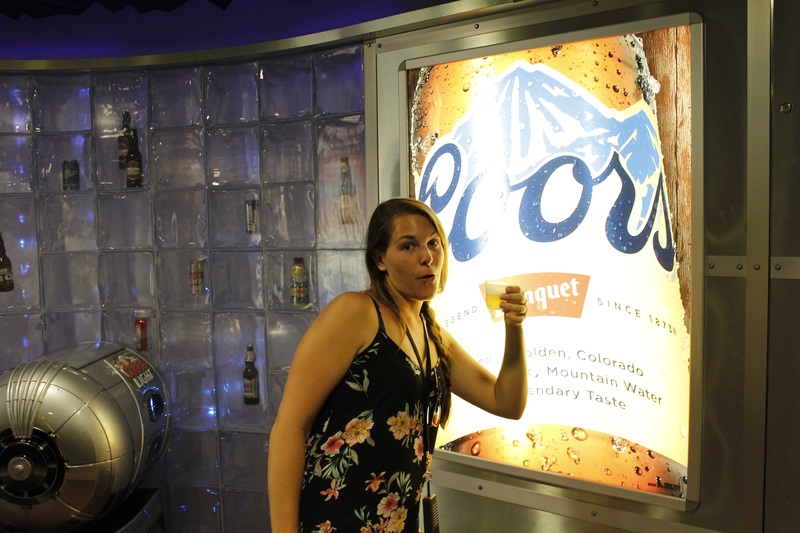 Coors brewery is very generous offering visitors 3 full glass of their choice of beer. Cheers! We finished with a quick peak at the gift shop and we went to get a good pizza slice! We took the rest of our day to visit Denver a little bit. We didn’t have a lot of time but we enjoyed just walking around the city. It’s a great city to discover on foot. 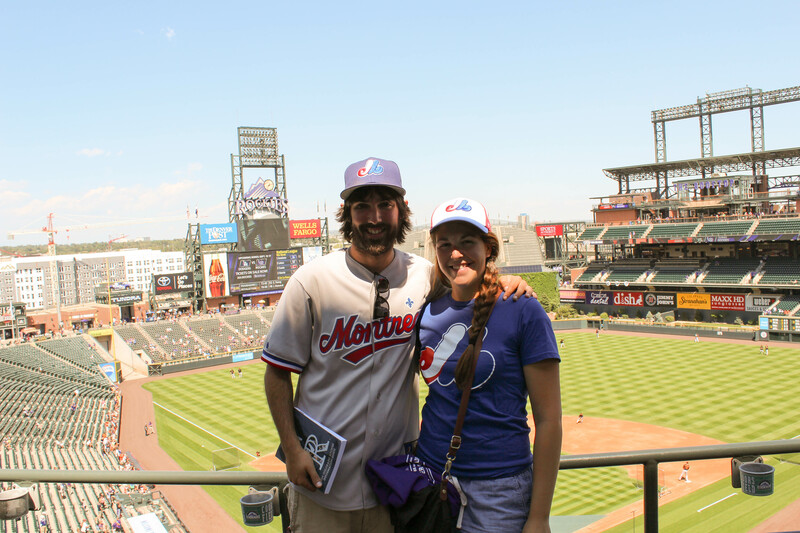 The next morning, we drove to Coors field for the Rockies game! We had a meeting set up with Irma Castaneda, who’s working for the communication department with the Colorado Rockies. She was nice enough to give us a tour of the ballpark and to answer all our questions. We headed first to the press gallery where we had a really nice view of the field. We must say that we had a beautiful day for baseball. We then walk around in the hallways where we could see the Giants memorabilia in glass cases: balls, shirts, bases, etc. We got down to the field level and we ran into Jeff Huson: former MLB player that started his career with the Montreal Expos! 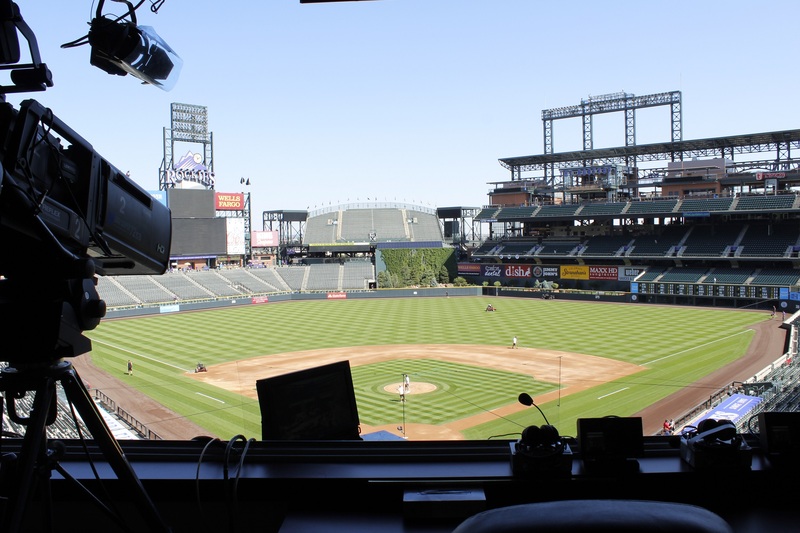 He is now a Color analyst for Root sports network at the Rockies. He still remembers the famous ‘’Pie-IX’’ station! We talked to him about our project and he encouraged us to continue! 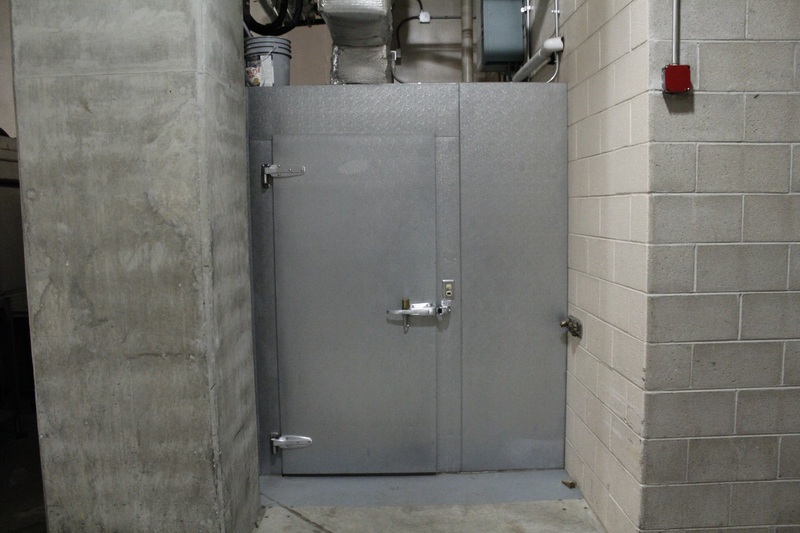 From there, we jumped by the post-game conference room and we headed to the field. Irma took a great picture of us with the field in background! All the trees and plants were planted when they opened the ballpark in 1995 and they simply grew fast! This zone is pretty impressive to see. 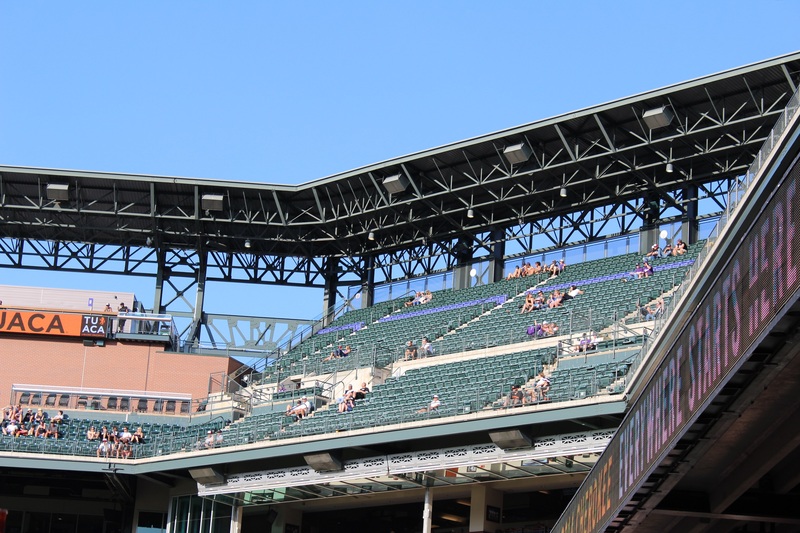 Irma also told us about the new ‘’rooftop’’ section of the ballpark. On the upper deck, the team discarded a huge seating section to install this restaurant\bar\relaxing area. From out there, you get a good view of the field. The owners know well how to manage space: they eliminated a part of the press gallery that was not used so they could put a bar at this place. Also, the seats that were at the rooftop spot were empty most of the time. So we asked Irma if the Denver people were big baseball fans. She told us that, obviously, Denver was a Broncos city (NFL team). 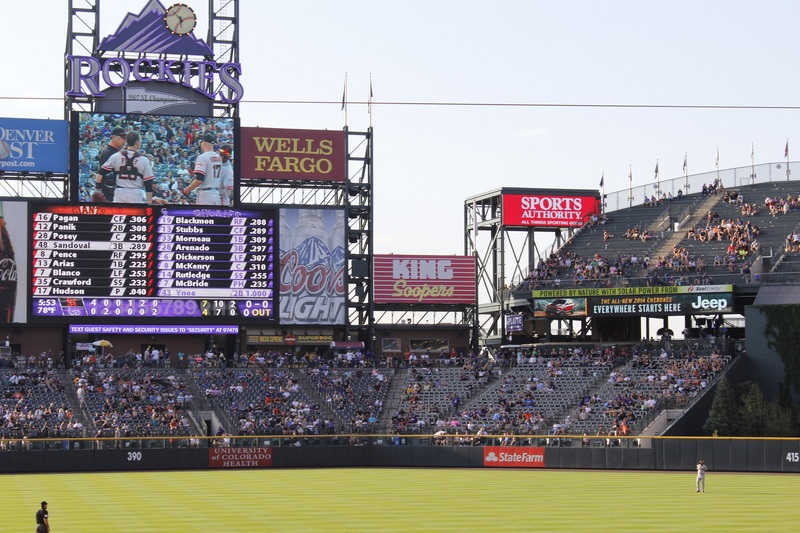 The Rockies have to find different ways to bring the people to the ballpark. 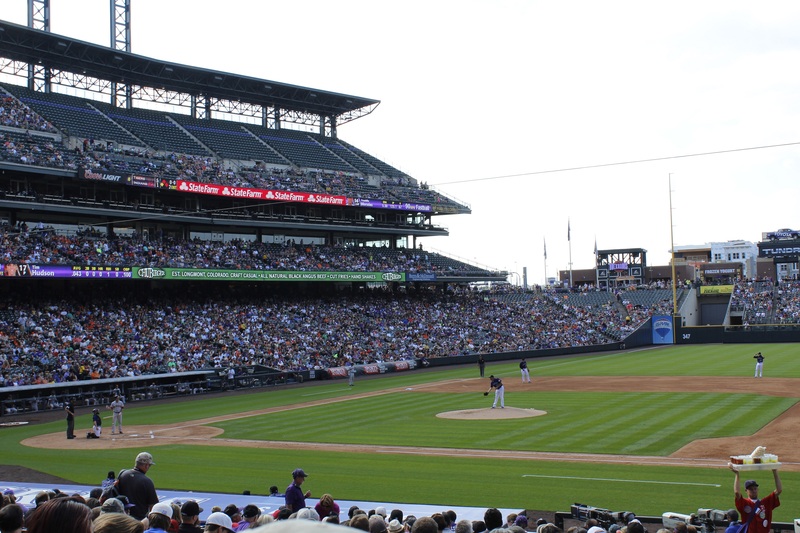 In the end, the Denver people just love to come to the ballpark and enjoy good baseball. They are around 30,000 on average each game this season and they have a really bad record! By the way, Denver is located about 5,000 feet above sea level. 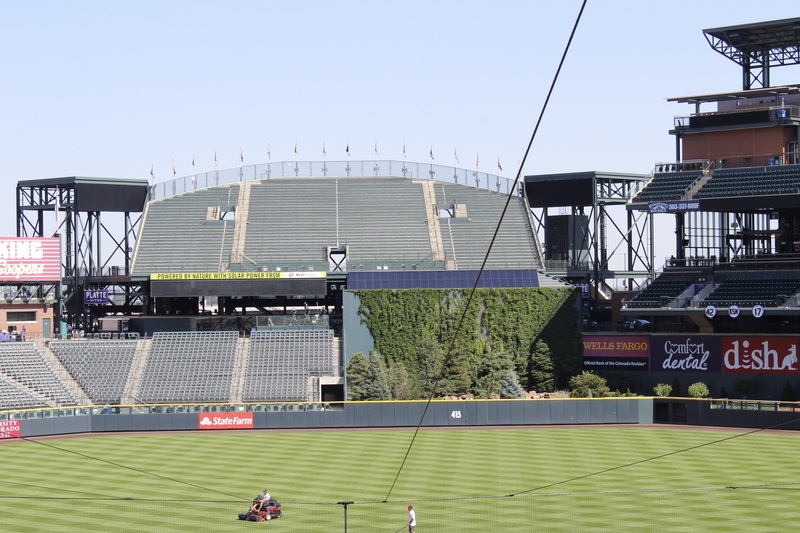 If you look on the upper deck, you’ll see that the 20th row is painted purple so you know where it gets exactly to 1 mile above sea level! It is something very special since the team got complaints in its first years that the ball was affected by the altitude and they were getting too many home runs. What solution did they found? A huge machine that keeps the ballgame exactly like they were when they got made! Impressing! Irma concluded the tour by giving us a ticket upgrade: awesome seats closer to the home plate then our usual seats! Thanks a lot for the visit and thanks for helping us in our project! We continued our visit of the ballpark when they opened the gates. 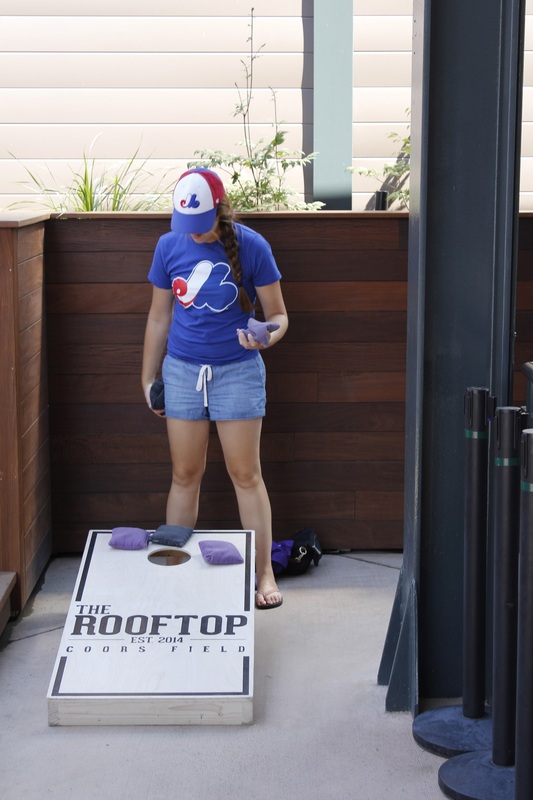 We loved the rooftop area, that is very recent, for his couches, bars, and bean bag toss game (let’s say Adry dominated the game!)! We also appreciated the food variety at the ballpark: they are even selling oysters! Also, they had a great choice of Colorado craft beers like the famous New Belgium’s Fat tire! 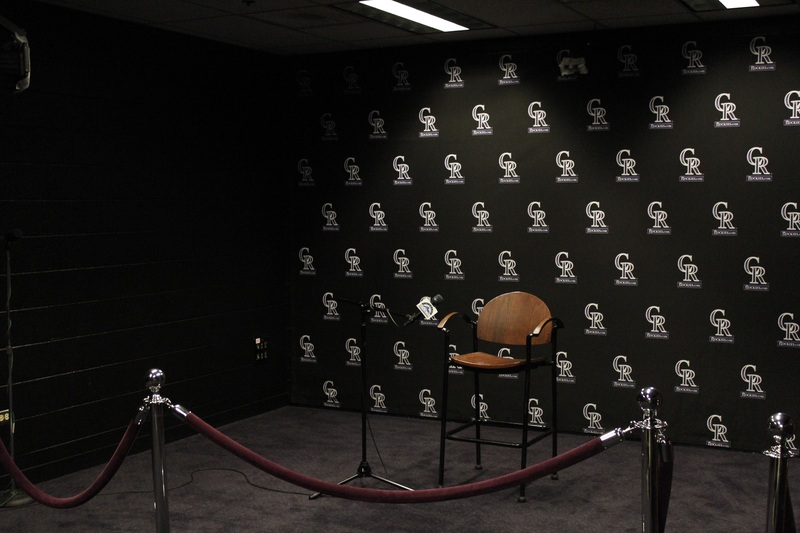 The Rockies also created a picnic section were fans can bring their food to eat on bigger tables. Finally, the famous Rock Pile: a seating area at center field where you can get 1$ (kids and senior) and 4$ (adults) tickets for the game. You can buy them in advance but they keep a certain number of the tickets to be sold on game day. 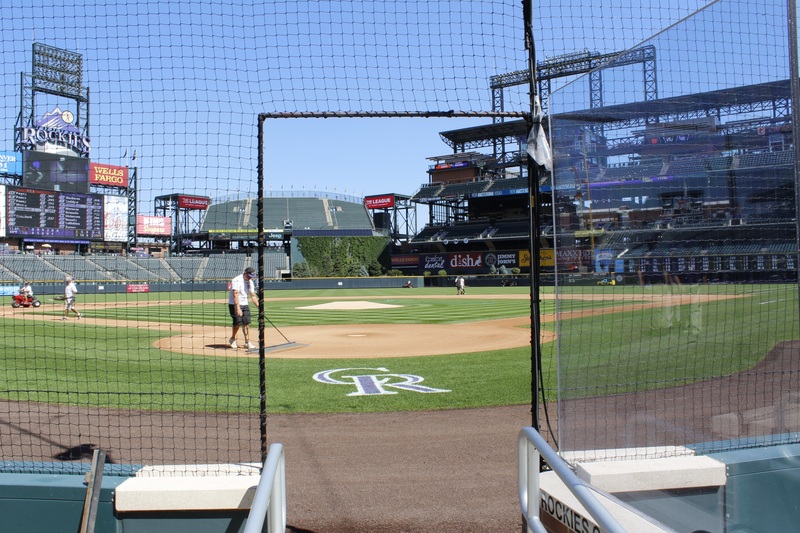 We heard this comment more than once: there is no bad seat in the Coors field. We had a particular schedule today: game started at 2h10… in the 6th inning! 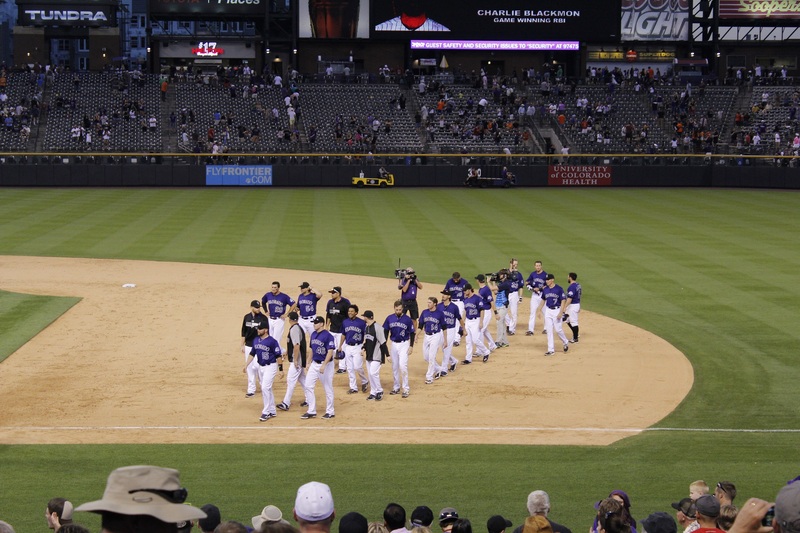 The Rockies and the Giants had to finish a game they played earlier in May. The game was tied so the umpires couldn’t call it a game when it was stopped. We won’t be talking a lot about this game except to say that the Giants scored two runs to win the game 4-2 and that we had a 7th inning stretch pretty early in the game! For the ‘’real’’ game, the starting pitchers were Franklin Morales (Rockies) and Tim Hudson (Giants) who just turned 39 in July! Many were thinking this game was already won for the giants that are in the high of the run for postseasons while the Rockies are already looking at next year. A lot of giants fans were at the game: we’ve been told a lot of people from California moved to Colorado in their life to enjoy the outdoors. Also, a lot of fans made the long trip since it was a long weekend. It started badly for the Rockies: A Hunter Pence Home run with two men on bases gave the Giants a 3-0 lead in the first inning before Joaquin Arias scored another run still in the first: Giants leaded 4-0. We had a nice rundown to end the inning! In the 2nd inning, the Rockies gave us hope with a DJ Lemahieu triple that scored 2 runs: 4-2 Giants. The Giants would score one run in the 4th and two others in the 5th to get a solid 7-2 lead. 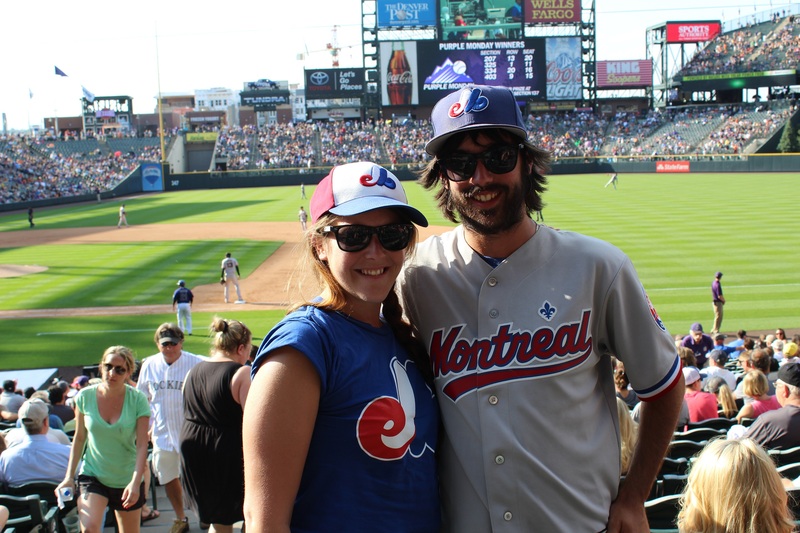 We started to understand why the Rockies were having a bad season but we always stay and cheer for the whole games. During the 6th innings, the Rookies scored 4 runs. A major thumbs up for Joe Panik mistake. 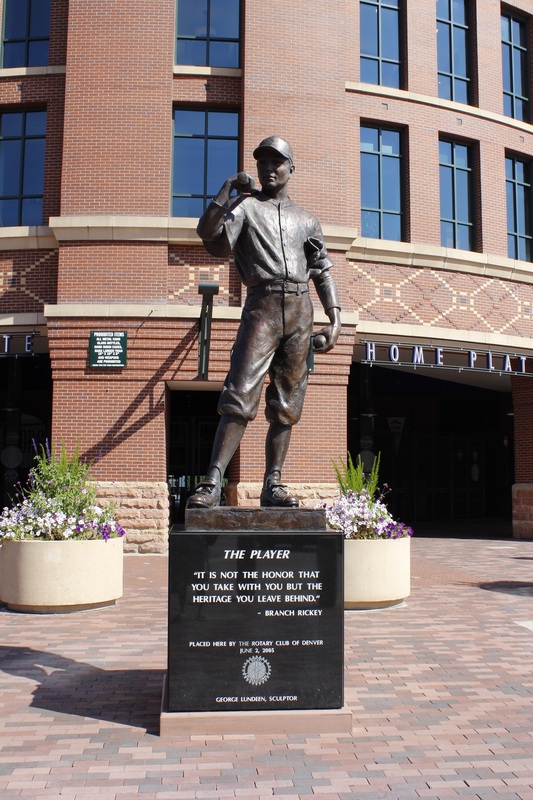 Because of him the Rockies were finally back in the game. By the way, it was the first official game of Rapael Ynoa and we can say that he did a pretty good job : 3 hits in 4 at bat and one RBI. It is now 7-6 Giants. On the 7th inning, Corey Dikerson scored and tied the game 7-7. Then, Ben Paulsen hit an home run and the Rockies took the lead 9-7. The crowd is now very excited and the Rockies fans became very loud. At that point, the former Giants fans, who were very loud at the beginning, are rooting in silence! But, LaTroy Hawkins blew off the lead of his team: with singles from Buster Posey and Pablo Sandomoval will tie the game again 9-9. Finally, Sergio Romo had the job of getting everyone into extra innings, but with Micheal McHenry on third, Charlie Blackmon will hit a single that will lead the Rockies to a victory : 10-9. What a great walkoff win! 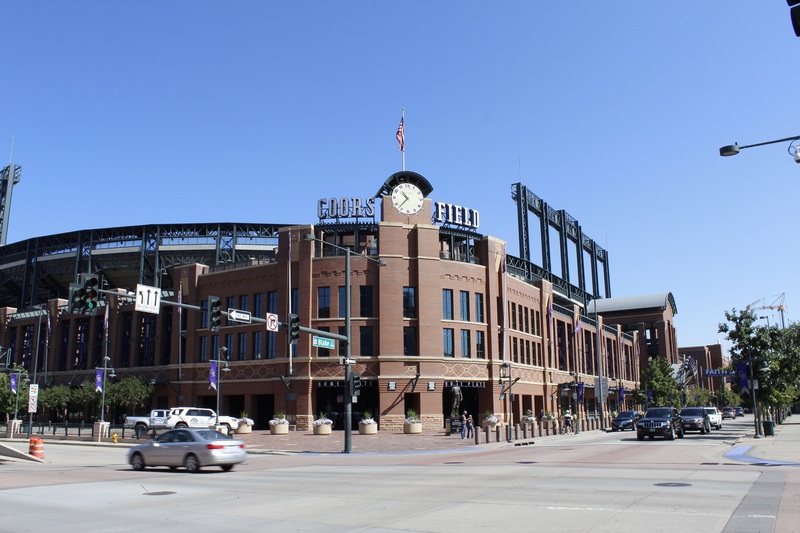 When we take a look at the Rockies we see a team that is part of the MLB league since 1993. This team expect approximately 37,000 fans every game. Also, since the creation of the Rockies, the team hasn’t had a winning since 2010. Also, this team never won a world series championship. It is very unfortunate that a few of their good players are injured this year like Tulowitzki and Gonzalez. 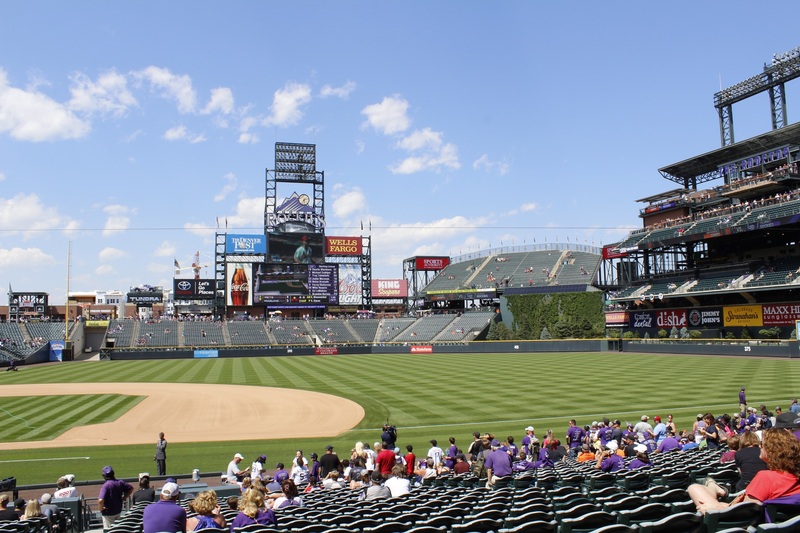 But still, we can say that the fan love to go to the Coors Field and to what a baseball game. After this great day, we can admit that the Rockies administration know how to manage his team with this theory:: solving problems with solutions. 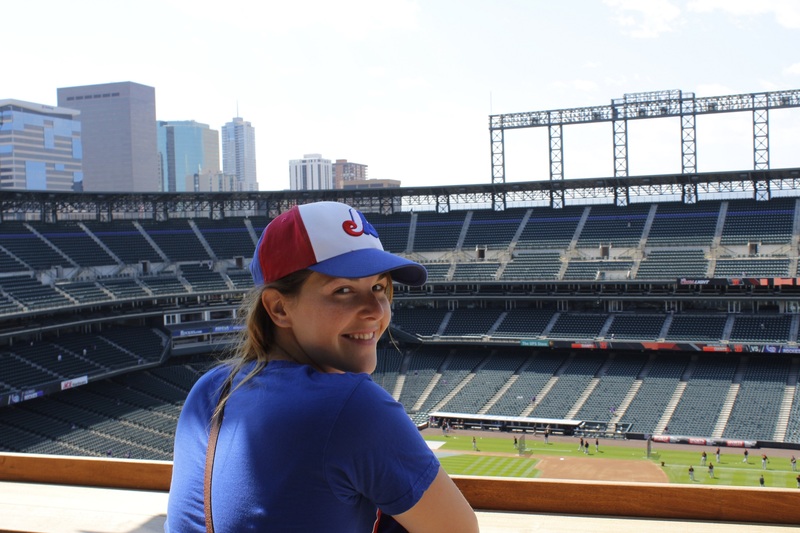 We really enjoyed being at the Coors Field. It is a very nice ballpark and as a fan you can appreciate the experience of the ballpark but also of the game. The area surrounding the stadium is full of bars, breweries, restaurants, etc. 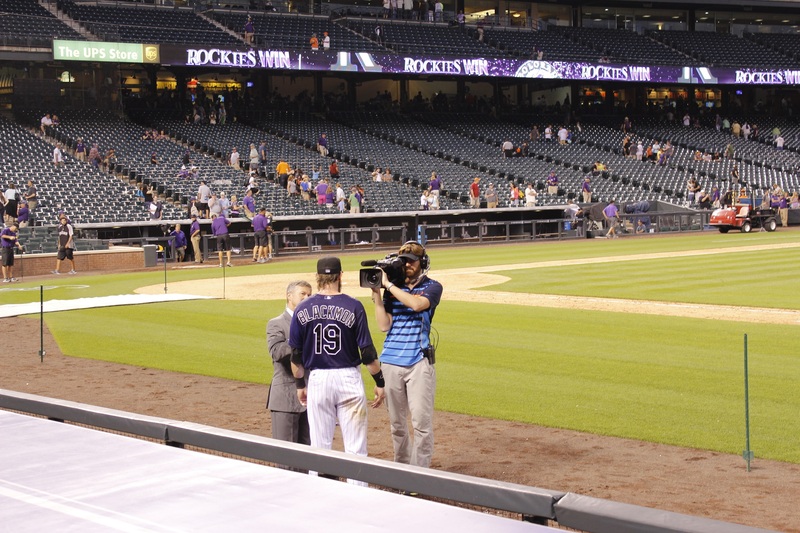 The Rockies fans have a lot to enjoy themselves before or after a game. 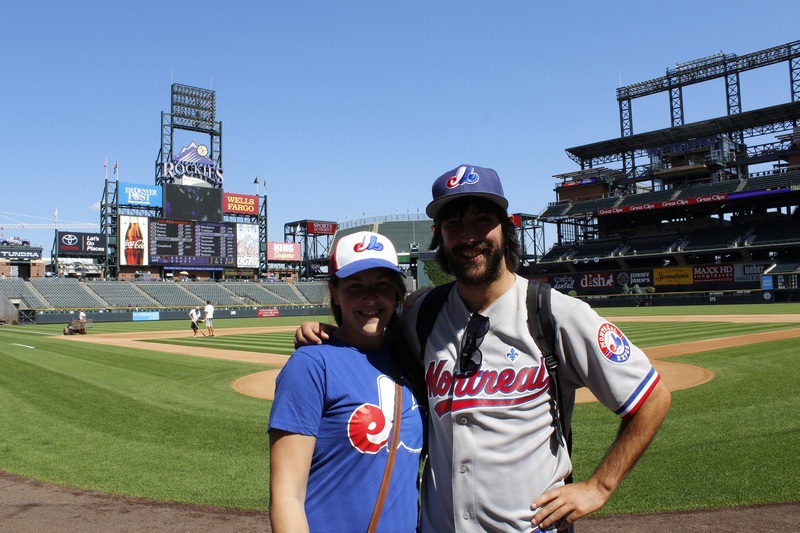 We had a great reception from the Rockies fans: a lot of them recognize our Expos gears and one them ask us to take a picture for one of his friends of was a major fan of the Expos. It was a very welcoming ballpark! We are now back on the road heading east : our next stop Kansas City and the Royals. P.S. Did you know that, earlier this season, the Rockies gave some give aways with a tiny problem: a t-shirt with a spelling mistake on Troy Tulowitzki name’s.